In a small bowl combine oils, vinegar, honey, and spices. Whisk to combine. 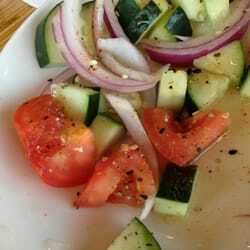 Chop the tomato into wedges, slice the cucumber and remove the seeded portion, and slice the red onion thinly. Add the veggies to a large bowl and pour the dressing over the top. Let sit for at least 5 minutes or more to marinate. Serve with grated ginger over the top. I do not see honey listed in the ingredient list. I have the real recipe straight from the restaurant how do I get it on Pinterest?